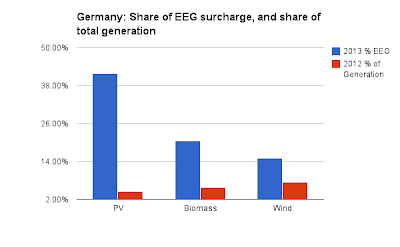 Factoring in taxes applied on top of the EEG, and the currency exchange with the now higher valued Euro, there is a good chance the 10 cents CDN, per kilowatt hour, will be hit for 2014. For 5% of generation from solar, maybe 8% from wind - coming with increased hard coal use, increased natural gas consumption, and an emissions intensity likely more than 4 times higher than Ontario's. I'm still missing how this is indicative of a role model.